This was a convention purchase for me by a friend of mine, who noticed in a recent "I Love Going To The Comics Shop" post that I had picked up a bunch of 1960s Sgt. Fury comic books on a recent trip to my hometown and its comics stores' rich, fertile dollar boxes. I don't have any particular love for this work, I'm just always astonished to see 1960s Marvel anything in the discount bins. I imagine that we see this more and more is due to years and years of the Internet savaging the very particular rules of the back-issues trade. It's become more and more clear that, say, random 1970s comics aren't going to sell to anybody for $11 just because issues of the 1980s version goes for $10. There's a lot of dead pulp out there. Sgt. Fury was an important title in Stan Lee's words because it proved they could use the Marvel formula on something other than a superhero comic book. Why this was important to Lee I'm not sure, it may have something to do with the parameters of his reputation as a writer, but certainly Marvel has published material other than superhero comics for big chunks of its existence. Finding one that worked with the action/comedy model they were doing elsewhere must have come as a relief. This is a sturdy example of late-'60s Marvel execution. That cover, for instance, a full-blown John Severin effort, is as handsome and dramatic as anything the company was doing at the time. It also represented a kind of different art-direction tack for Sgt Fury, which was more or less given over to group scenes and brighter colors in its early existence. The contents feature Nick Fury, an "I'm always right and this story is going to be partly about your ability to come around to my rightness"-style hero in the mold of Sherlock Holmes, Reed Richards and Captain Kirk, stuck in an underground resistance stock World War II movie scenario as opposed to a caper scenario or any of the other set-ups the comic might borrow from a rich tapestry of films likely familiar to most people reading. In fact, with its dropped or generic backgrounds, I'd say this book counted on that kind of familiarity at a formal level, leaving it up to you to pick up on the few visual details provided and create a rich or at least functional world in your head. Hitler and MacArthur make early-story appearances, FDR speaks from off-panel, and at one point Fury tosses his gun aside to have a fistfight in the middle of a firefight with the man who betrayed him into custody. It looks like the creators are having fun: there's even a cinematic girl-kissing-Nazi/boy-punching-Nazi sequence that charms for its blatant "look at me" qualities. 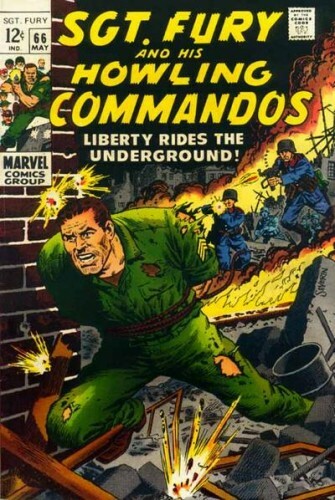 My suspicion is that one of the reasons that Nick Fury has endured as a character and these World War II battles went on for such a very long time is that pop culture began to churn out war movies that bore a greater resemblance to Sgt. Fury than the more button-up films of years past. I don't think that was the comic book's influence, but I do think they caught on to a more insouciant way of doing such stories that some successful film efforts caught onto as well. This sideways trip into a brand new realm of war stories -- they're going to try to capture Hitler next issue -- may shock in how little they seem to value this new material as a resource. They burn through more plot in this comic book than in four issues of a Marvel comic book might today. I'm not sure the relative sophistication of the modern book is enough to make me forget how little "there" there can be. It's hard to make too much fun of the steak, boiled vegetables and baked potato of my dad's generation when my era is more likely to provide a turkey wrap or a small yogurt.